It’s nearly a year now since NICE recommended that all severely to profoundly deaf children should be given the option of a cochlear implant in one or both ears – so now seems a good time to check again that local health boards in England are getting on with it. The bad news is that do appear to be a few malcontents popping up around the country. Whilst I don’t believe for a moment that it really is grim up north, I have to note that one of the worse offenders appears to be the Cheshire area in the North West where NDCS has supporting a family who wanted their deaf son to have a second cochlear implant (having already received one implant). The NICE recommendations allow this – and patients have a legal right to anything recommended by NICE. Despite this, this family were forced to go through lots of pointless bureacratic hoops and make several funding requests before the local health board caved in. Totally not on. The story got covered in their local paper, and hopefully the local health board won’t try it and pull a cheeky one again. NDCS is keeping an eye out for similiar stories around England, and taking swift action where it does. Please get in touch if you have any specific examples to share, and we’ll get on the case. Whatever happened to… the NICE report on cochlear implants? As it’s a relatively quiet month, I’ve been spending a lot of time dealing with trains of thought that start with: “Whatever happened to…” Mostly, on work issues but sometimes I have found myself drifting into a reverie about, for example, Ace of Base, purveyers of classic Swedish pop from the 90s. Anyhow, one work issue that we’ve been checking up on is cochlear implants. 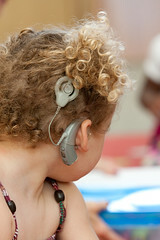 Back in January, it was announced that all deaf children for whom it was appropriate would have the right to cochlear implants, following a report from the National Institute for Health and Clinical Excellence (NICE). Three months later, the new rules on this came into effect. So how’s it gone? Well, if no news is good news, then it seems to have gone reasonably well with most primary care trusts appearing to just get on with it and following the new rules. We’d be interested to know if that’s the experience of others on the ground as well. Particularly as some localised problems have popped up recently. We’ve become aware of a case in the North West of England where a deaf child has been confirmed as a candidate for a second cochlear implant but the primary care trust have refused to fund it, without giving any clear reasons. NDCS is supporting the parents on this particular case and the campaigns team stands ready to intervene. Interested to know others views and experiences in this area. And, of course, if there’s anything you want to know whatever happened to, happy to see if I can oblige.